Phuket: A woman has died after being crushed by a water truck on Kata Hill last night (Mar 20). UPDATE: Capt Channarong Prakongkue of Karon Police confirmed to The Phuket News that the driver of the water truck, Apichart Sripan, 32, handed himself in this afternoon and has been charged with causing death by reckless driving. Karon Police were notified of the accident at around 7pm. Capt Channarong Prakongkue of Karon Police and Phuket Ruamjai Foundation rescue workers arrived at the scene approximately 80m from Soi Hinkaaw where they found three people lying on the road next to two motorbikes. 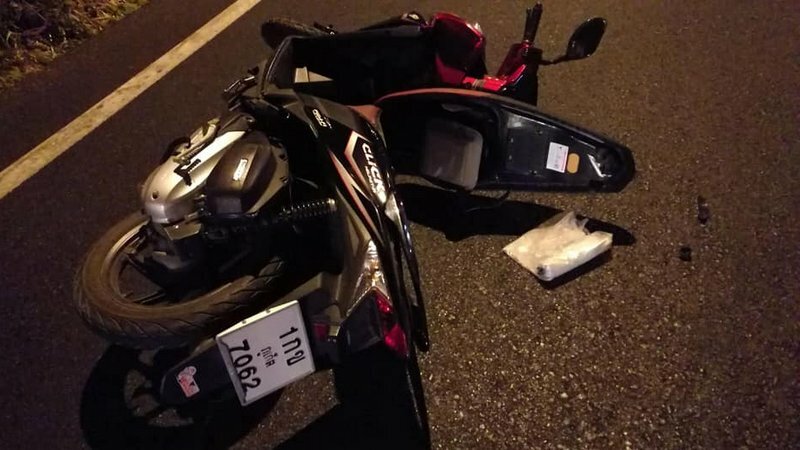 Capt Channarong reported that Ms Natticha Attachiwa, 26, was riding a black Honda Click motorbike on the hill, followed by a blue Honda Click driven by Mr Pachorn Plaisang, 25, who had a passenger on the back, Ms Tanarat Thipwimolkarn 24. Both motorbikes slipped on oil as they drove down the hill. Natticha fell under a water truck and her head was crushed. 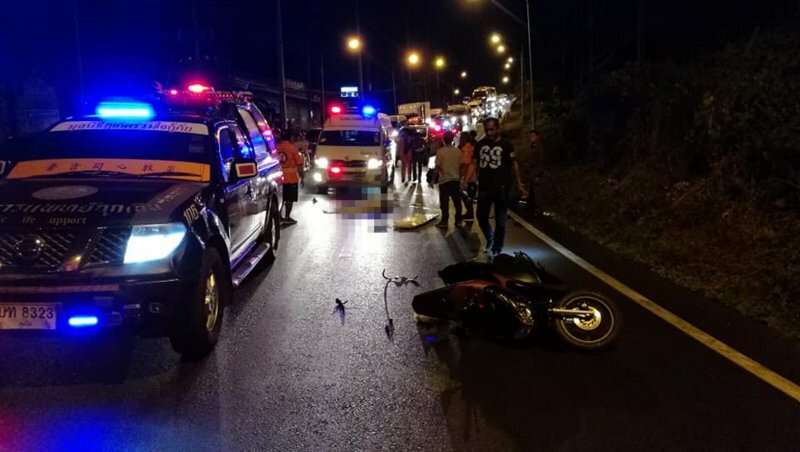 Pachorn and Tanarat were fortunate not to be hit by passing vehicles although they were injured and rushed to the Accident & Emergency Centre of (the yet-to-open) Chalong Hospital. Natticha’s head injuries were very severe and she is believed to have died instantly. She was taken to Vachira Phuket Hospital where she was pronounced dead on arrival. The accident caused heavy setbacks on the hill as officials covered the oil with slaked lime. Capt Channarong reported that witness statements and CCTV footage revealed that the driver of the water truck parked up about 100m away when the accident happened and walked over to check on the victims. When he noticed a bystander video recording, he went back to the truck and drove away. Police are inspecting local CCTV footage to try to locate the truck which as of this afternoon (Mar 21) was still unsuccessful and proving to be difficult, according to Capt Channarong. How hard is it to find out which hotels in that area order a watertanker around that time. CCTV cameras along the route are also a help ( if they work! Do they?). + that Video recording! Find the watertanker, lift it and find DNA traces underneath. This water tanker driver deserves  prison time. Heartless driving away from a deadly accident scene is criminal.